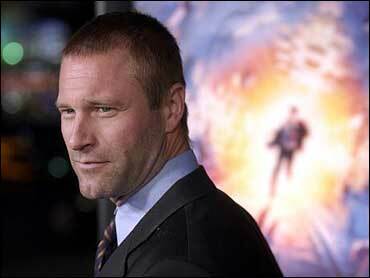 Actor Aaron Eckhart is best known for his critically acclaimed performances in the films "Erin Brockovich" and "In the Company Of Men." In his latest film, "Paycheck," he plays a billionaire entrepreneur who promises lucrative compensation to an employee played by Ben Affleck. In John Woo's thriller, Jimmy Rethrick (Eckhart) and Michael Jennings (Affleck) were buddies who wanted to save the world through technology, but in the end Rethrick ends up using his best friend, explains Eckhart. He tells The Early Show co-anchor Hannah Storm, "I create a machine that can see into the future. I fund it and I organize it and then he turns his back on my project, which makes me mad, so I have to try to kill him." In real life, Eckhart says the thought of looking into the future scares him. He says, "Luckily, we haven't gotten there as far as I know, yet. I can't watch myself on television and would never be able to watch myself in a futuristic machine." The reason he feels uncomfortable watching himself on TV is because he likes to be in control, he admits. Referring to his work in "The Pledge" under Sean Penn, Eckhart says, "Sean is great because he's an actor and he allows you the time to create with him and the crew and he has complete control. Sean is a control freak, too, by the way. We're all control freaks so I'm not an anomaly. I'm not normal, but I'm not an anomaly. You know, he makes actors comfortable and creates a safe place. John Woo, also." But now that he had his share of villain characters, he says he is ready to be the good guy. "This is my last bad guy. Forget about it," he says. "I want to do a romantic comedy or family dramas." Eckhart spent part of his formative years living in England, and, after dropping out of high school, in Sydney, Australia. Eventually earning his high school equivalency, he enrolled at Brigham Young University (majored in film) where he met future collaborator Neil LaBute. After college, moved to New York City. His first taste of success was being a construction worker in an advertisement for Miller beer; reportedly earned $40,000. He also had small roles including a turn as Samson in the 1993 CBS special, "Ancient Secrets of the Bible, Part II." In 1997, first caught moviegoers' attention in his film debut as the unctuous businessman Chad in college classmate Neil LaBute's wicked black comedy "In the Company of Men." And the following year he was in LaBute's "Your Friends and Neighbors." Cast as an overweight, impotent and unhappily married man. In 1999, he landed a more conventional role, playing the title character's overprotective brother in "Molly." And in 2000, he was seen as the pony-tailed biker who eventually wins the heart of Julia Roberts' "Erin Brockovich." Also in 2000, he reunited with LaBute to be a used-car salesman who neglects his sweet-natured spouse in "Nurse Betty." In 2001, Sean Penn tapped Eckhart to play a young detective partnered with a grizzled veteran on the verge of retirement in "The Pledge." In 2002, he was cast opposite Gwyneth Paltrow as an academic attempting to reconstruct the relationship between two Victorian-era authors in LaBute's "Possession." The following year, he portrayed a geophysicist who, along with Hilary Swank and Bruce Greenwood, set off to detonate a nuclear device and save the world from destruction in the sci-fi thriller feature "The Core." He currently has a small part in Ron Howard's "The Missing" opposite Tommy Lee Jones and Cate Blanchett, and will star in the upcoming "Suspect Zero" with Ben Kingsley.